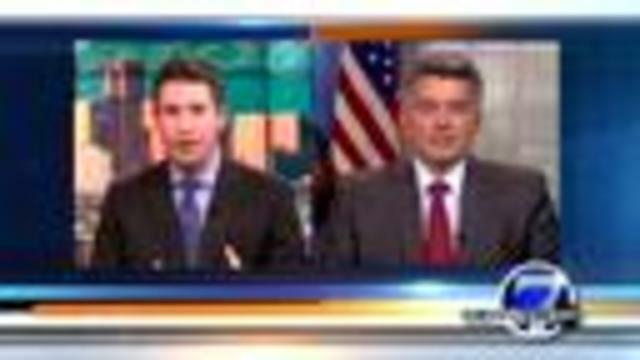 DENVER – Colorado Sen. Cory Gardner has been among the most-scrutinized politicians in Washington in recent months. Gardner is a Republican in a state won by Hillary Clinton, but which has strong Republican and independent factions as well. But he has drawn the ire of many Coloradans after voting in favor of President Donald Trump’s nominees and measures every chance he’s had so far, and caused a stir with a comment about protesters at his offices in Colorado being paid. 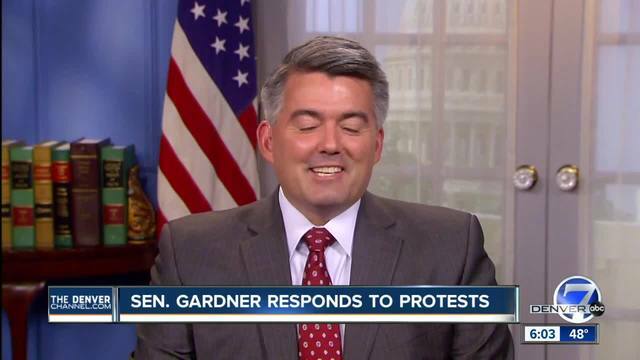 Gardner on Tuesday sat for an interview with Denver7 to explain his voting record with the new administration, his thoughts on the protests and the fallout from National Security Adviser Michael Flynn’s resignation Monday night. Watch the full interview in the player embedded below. 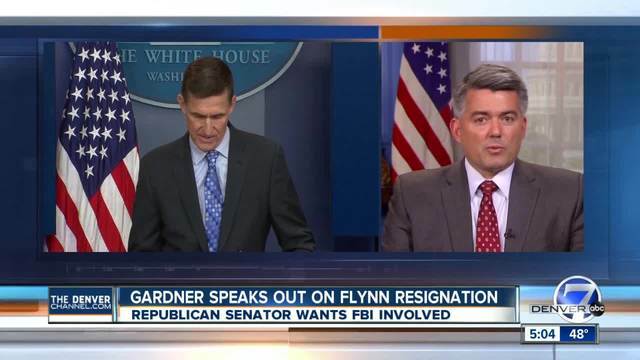 Gardner had not previously commented publicly on swirling allegations that Flynn had discussed sanctions on Russia with its ambassador to Washington, Sergey Kislyak. But on Tuesday, in the wake of Flynn’s Monday resignation, Gardner said it was right for Flynn to step aside. He said that he would wait for the FBI to determine the route of any possible further investigations into Flynn. That came as several other high-ranking Republican Senate members called for an investigation into ties between Trump and Russia and called for Flynn to testify. Gardner maintains that Democrats on the Hill are causing much of the political divide by objecting to and delaying some of the new administration’s confirmations. And though several Senate committees delayed committee votes on some of the cabinet picks and Democrats used Senate rules to hold the floor for nearly 24 hours in an effort to vote down Betsy DeVos as Education Secretary, the GOP line that there is “unprecedented obstruction,” which has also been used by many other Senate Republicans, does not completely hold water. After Republicans won back the House and Senate, they in 2013 boycotted a committee vote on prospective EPA administrator Gina McCarthy and famously failed to meet with President Obama’s Supreme Court nominee, Merrick Garland. But all of President Trump’s nominees have so far been confirmed, and that is likely to continue since Republicans hold majorities in both chambers of Congress. Gardner says he has a positive outlook on the administration’s future. “Regardless of what party people are, regardless of whether they voted for President Trump or voted for Hillary Clinton, we would always do our best to make sure our days ahead of us are better than the ones we just went through,” he said. Thousands of people displeased with Gardner’s votes and alignment with President Trump have flooded his phone lines and email inboxes voicing their lack of satisfaction. They have also taken to his offices in Colorado to protest. “I want to hear from you. 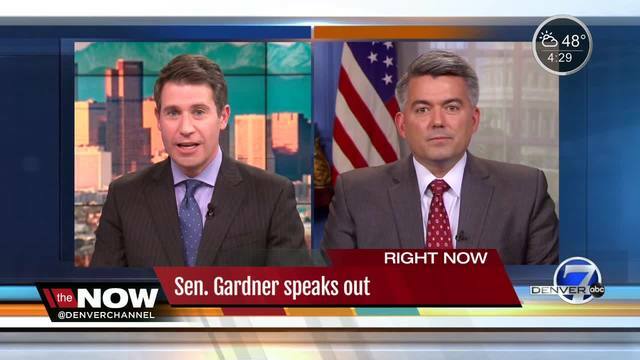 I continue to encourage my constituents to reach out to me to share their opinions - whether through meetings, phone calls, email, or social media,” Gardner said in a statement to Denver7 Monday. On Tuesday, he addressed the insinuation he made last month that some people protesting him and calling his office were paid protesters. He clarified that he believes there are organizations that are working to connect politically-active people across the country with various lawmakers in Washington, citing a conversation his wife had with one organization. “We have a number of Coloradans – a large percentage, if not a huge percentage of the people calling our office who are Coloradans. [They are] people who are concerned about nominations, people who are concerned about the price of their health care,” Gardner said. “She was not paid to do that, but somebody was paid to make that connection happen not knowing that was my wife,” Gardner said. He says he and his staff appreciate the input from his constituents, and points to his and other Republicans’ urging of Trump to impose a strict policy toward Russia and increase cybersecurity . Gardner will next be up for re-election in 2020.